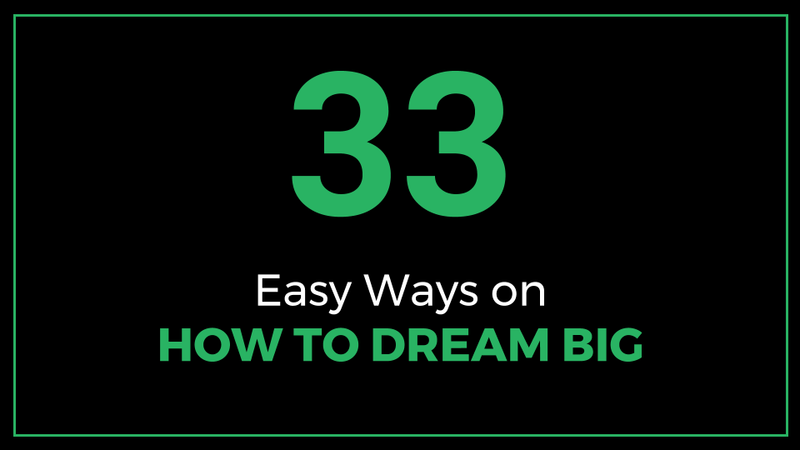 This article will take you on an in-depth, informative and comprehensive journey into the world of dreaming big by describing 33 Easy Ways on How to Dream Big, including how to set goals for your dreams and the life cycle of a big dream and conclude with a passionate letter to big dreamers. At some point in your life you have heard or come across any or all of the following phrases: Dream Big, Think Big, Follow Your Dreams and Live Your Dream. You can quickly skim all the 33 tips on the table of contents below and then click on any tip to read further details. We are often told that we should dream big. Have a dream that is bigger than you. You will go as high as your dreams. But what exactly does that mean? What is a dream? According to the Merriam-Webster Dictionary, a dream is a series of thoughts, images, or emotions occurring during sleep; or an idea or vision that is created in your imagination and that is not real; or something that you have wanted very much to do, be, or have for a long time. We can define a big dream as follows: A big dream is a substantial wish or an aspiration for something, of which when we attain it; we believe it would fulfill or satisfy an inner longing or desire. A big dream is a powerful idea. Different people have different dreams. We all have a secret or not so secret wish list of things that we desire in life. It could range from something as simple as wanting to be a better person, wishing to make a difference in your life and that of others, to things like getting a job, getting a college degree, buying a car, and a house. Other dreams include: getting married, having children, getting a promotion, having good friends, leading a comfortable life, being financially independent, helping others, starting a business, inventing something, traveling around the world, becoming rich, becoming famous, winning an Olympics gold medal, retiring early, wishing to go to the moon, traveling to space, wanting to fly, and diving to the deepest depths of an ocean. More dreams include a desire to win an Oscar, to be a millionaire, to be a billionaire, to be a philanthropist or to get a PhD. Whatever your dream is, you should own it and be proud of it. A big dream is a bold vision of the future, a vision that both scares and excites you at the same time. It brings out your passion, imagination, creativity and a willingness to take and embrace risk. You can see the final destination in your mind’s eye and it inspires and empowers you. A big dream is the fire in your belly that fills you up with a craving to make yourself and things better. The dreaming process revolves around answering four important questions: what, why, when and how. What do you want to achieve? Why do you want to achieve it? When do you want to achieve it? How will you achieve it? At the initial stages, dedicate your time to clearly defining the “what”, “why” and “when”. Knowing what your big dream is, why you want to achieve it and when is a very powerful driving force. The “what”, “why” and “when” are usually fairly easily to identify and define. The “how” can take anywhere from a few seconds to figure it out to a lifetime. Your reason “why” will keep you going when nobody else believes in you. It is that gut instinct that will strengthen you and keep you in the race when you feel tempted to give up. Your big dream is your personal internal compass that guides you through your life’s journey. Set high goals and aspirations. You can have more than one big dream if you wish, it is however best to relentlessly pursue one big dream at a time to achieve the benefits of focus and discipline. Have a compelling reason to get out of bed every morning. Ask yourself – How big is your vision? Are your dreams big enough? At the end of the day what matters is whether you believe that your dream is of value to you. Your dream is your purpose and your personal mission statement. Knowing your purpose in life gives you peace of mind. Your purpose is what differentiates you from everyone else. What is your personal “I have a dream” speech? Just like Martin Luther King Jr. inspired many with his “I have a dream” speech perhaps we should all craft our own dream speech to inspire ourselves. Let us have fun with our imagination, think about something so big, something that can immediately be labelled as being impossible, and then reverse engineer it to find out why is it considered impossible? What can make it possible? Does it feel overwhelming thinking about that “impossible” dream? Typically we do not know all the steps that are required to achieve our big dreams (the “how”). You start off with a vision of something significant that you want to achieve then you break it down into small pieces or components that are easy to chew one bite at a time. It is very rare to eat up your entire dream in one bite. Do one small thing everyday aimed towards achieving your big dream. You will figure out the steps one at a time. Some steps will work and others will not. When the steps that you have taken do not lead you on the desired path, you simply retrace your steps back to a predetermined base, pull out your binoculars, survey the terrain so to speak and then take another path. Sometimes you can repeat this process multiple times like Thomas Edison did it 10,000 times; eventually you will find a path that will lead you to your destination. Also don’t forget all the knowledge, learning and experience that is gained during the periods when you are spinning wheels. In fact you get to learn numerous ways about what works and what doesn’t and you become far much wiser and more self-aware than when you started out on your journey to pursue your big dream. Your character as a person is also built up and you learn more about yourself. You also strengthen your patience and perseverance muscles. It is very rare that you would achieve your dream overnight. It takes hard work and patience to accomplish our life’s desires. There will be challenges and adversities along the way. The highway to dreams is littered with casualties on the side of the road. These are instances where people gave up on their dreams because the going got too tough to handle. I am always amazed by the story of Thomas Edison who developed a long-lasting, practical electric light bulb. What would compel someone to work on an invention for 10,000 times and not quit or give up? What kind of willpower and tenacity would it take? What thoughts ran through his mind when he reached invention number 100 and it didn’t work out? How did he motivate himself to work on invention number 101. From the comfort of hindsight we now know that when Mr. Edison was working on invention number 101 he was still 9,899 inventions away from achieving his dream. However, Thomas Edison did not know that and he did not have the benefit of a “future forecast” that would be telling him “you are getting close, keep on going”. It was all dependent on his own internal self-drive, personal motivation, a laser focused vision and keen desire to achieve his dream. Perhaps there were people around him who tried to discourage him and told him that he was spending too much time on his invention and that it would never work. You should write down your big dream. The very act of writing it down signifies a commitment to yourself that you are willing to do what it takes to achieve your dream. It makes the pledge real in your mind. You should be very clear and specific regarding what your dream is, what you want to achieve, why you want to achieve it, how you will achieve it (if you know the “how”), and how you will measure the progress. Develop a mental vision map for your dream. Your big dream should make you excited and afraid at the same time. Close your eyes, fast forward into the future and imagine that you have accomplished your dream. How would it feel like? Write down a detailed description of what the end goal looks like. What kind of person will you be at the end of your dream? Visualize this future reality and observe it keenly in your mind’s eye. Carefully note all the things that you would be doing then and let this image guide your path. Carefully choose what is really important to you in your life. Have a bright and clear vision. Be a risk taker, go against the grain, and avoid the “follow the crowd” mentality. You do not have to fit in to achieve your dreams. Do not be timid. Don’t be average. Chase your dreams and follow your heart. Your big dream has to be very clear in your mind; you can see it, taste it, smell it and articulate it. It should ooze out of all your pores. The next step after you have written down your dream is to develop smaller goals which all feed into your big dream. Turn your big dream into action and reality by converting your dream into goals. Begin by clearly defining the goals. Breakdown your big dream into specific goals, small tasks and milestones. For example if you have a 20 year dream, you can break this down into 10 year goals, 5 year goals, 1 year goals, 6 month goals, quarterly goals and monthly goals. Categorize your goals into a few long term (more than a year) and a few short term goals (less than a year). Identify which actions you have to take to achieve your goals then breakdown the big actions into smaller tasks – think of tasks as ‘to-do list’ items. Assign a timeframe to the different goals and tasks. Identify what skills and resources you will need. Prioritize the goals so that you know which ones to focus on first. Assign a way to measure how the goals are being accomplished. This will help in tracking the progress. Additionally, keep track of the tasks that you are doing that add up to a specific goal or milestone. Give yourself a deadline for achieving the overall dream and also mini-deadlines for accomplishing each of the goals. Read your written down dream on a regular basis to refresh yourself, keep you focused and evaluate the progress that you are making. At all times when writing goals and executing them, keep reminding yourself of the reason why you are pursuing your big dream. Your reason or reasons are the driving force that will keep you persevering when you face obstacles along the way. Revise and update your goals at regular predetermined intervals such as on an annual basis and realign goals that need amendments based on current and evolving circumstances. Create a visual portfolio of what your definition of success looks like. This is a visual representation or depiction of what the reality would look like when you achieve your dream. Paint, post photos, cut out magazine images, clip out words, stories, newspaper articles etc. to create a success portfolio whose contents illustrate the outcome of your big dream i.e. what your destination looks like. Your success portfolio can be digital or hard copy. It visually and clearly answers the question “where am I going?” or “What am I trying to achieve?” It shows the “treasure” at the end of your treasure hunt. It is your case of gold at the end of a treacherous sea voyage riddled with pirates all around you who were trying to steal your gold. Let the images in your success portfolio sink into the deepest part of your mind by looking at it regularly. As it ferments in your brain and you keep reminding your brain how powerfully you want it to work, the subconscious mind should send you little clues on what hacks to do. Keep reminding yourself of these images and let them motivate you as you climb the ladder to achieving your dreams. Start with a big vision. Break it down into small steps, more manageable parts. Define a deadline. Do your homework; think through the pros and cons of going after your dream. Create an action plan. Define what your dream is. Define what success looks like to you, what results and expectations do you want to accomplish? Develop an implementation strategy. Do planning. Do the work. Monitor progress. Account for external circumstances that are beyond your control such as the economy, weather, political situations etc. Account for interpersonal challenges – you will rarely achieve big dreams on your own. You will work through others. Polish up on your communication, negotiation and relationship building abilities. Get creative on defining how you will achieve your goals and build and iterate as you go along. Embrace big picture thinking. Continuously improve and make corrections along the way. What resources do you have and what don’t you have? Plan for worst case scenarios, risks, challenges, setbacks and mitigation steps. Be a lifelong learner. Track your performance. Have belief systems. Learn from failures. Have small wins and milestones along the way. Celebrate when you reach your ultimate destination. Do a postmortem at the end. Repeat the process by dreaming bigger dreams and implementing them. A key takeaway is to develop and implement as many repeatable, replicable and scalable steps as possible. The more time and effort that you take in planning the easier the implementation would be. Procrastination is a dream killer. Don’t make excuses. Be an original. Don’t worry what naysayers think. Don’t stop till you achieve your dream. Make the dream implementation process fun, make it a game. Build your house one block at a time. Take time to relax and refresh your mind and body – guard against fatigue. Motivate yourself. Take time to laugh. Thoroughly study those who have achieved what you want to achieve. Work on your self-awareness and emotional intelligence. Know your strengths and weaknesses. Be willing to zig zag. Have long term vision. Choose something specific and go after it. You are planting a seed that you should water every day. Know your passion in life – What makes you happy? Learn something new every day and embrace fear. Imagine that your big dream is like a big, gigantic carrot. Take a giant knife and chop up the gigantic carrot into small pieces. Then hypothetically place all the small chopped pieces of carrot into a bag and get blindfolded then get into a helicopter that is flying haphazardly and you randomly scatter one piece of carrot over a wide area at an interval of one piece of carrot per mile. Each of these pieces represents small milestones that you should achieve. Your key task is to plot, strategize and develop a plan for how you will retrieve each carrot one piece at a time. You do not know where the chopped pieces landed so this adds to the uncertainty and pressure of finding them. Give yourself a deadline to find all the chopped pieces of carrot. Once you find one small piece you can have a small celebratory dance and high-five someone then move on to find the next piece and the next as if you are completing a big puzzle. This is a simplistic depiction of what action planning for a dream entails. It consists of seeing the big piece, cutting it down into bite sized pieces, going after each small piece one at a time, celebrate each time you reach a milestone, and keep moving forward pressing towards the prize. Each time you reach a milestone and you reward yourself, your brain increases the level of dopamine which results in a feel good, happy sensation. The dopamine released from each small win and reward will propel you to move forward, repeat the rewarded actions and capitalize on the natural momentum. Sometimes when we buy a simple item that has a clearly written instruction manual, do you find yourself fiddling and hacking your way to assemble or use the item then after you have finished you look at the instruction manual to double check what you did against how the instruction manual says you should have done it? What drives this sense of curiosity to figure things out? The very act of dreaming and workings towards your dreams has immense benefits for your well-being such as: greater motivation, more self-confidence and assurance, more happiness and more purpose in life. Your big dream is like a plane flying to a specific destination – you have taxied on the runway, you have taken off and climbed to cruising altitude and you have programmed the destination. There is no assurance that your flight will be uneventful, there could be turbulence, there could be a storm, you could run out of fuel, you could encounter engine problems, encounter bad weather, any set of circumstances could happen but you still continue with the flight hoping for a safe landing at your destination and at the same time using your wits to fight with the challenges that you encounter along the way. As obvious as it sounds, achieving dreams takes work, a lot of work and the first step is to take action. Without action, big dreams are simply dreams. Break away from fear, start acting on your dreams, and get ready to break some egg shells. The biggest dream killer is dreaming big and then doing nothing. Get started, hit the ignition switch, step on the gas, engage the gear and start steering. Unleash your greatness. Develop an inquisitive mind. Respectfully ask lots of questions about different phenomena that you observe and encounter in your life. Listen to input from others, they could give you some insights that you hadn’t thought of that you could help you towards the accomplishment of your big dream. Seek feedback from others regarding how you are performing in your dream expedition. 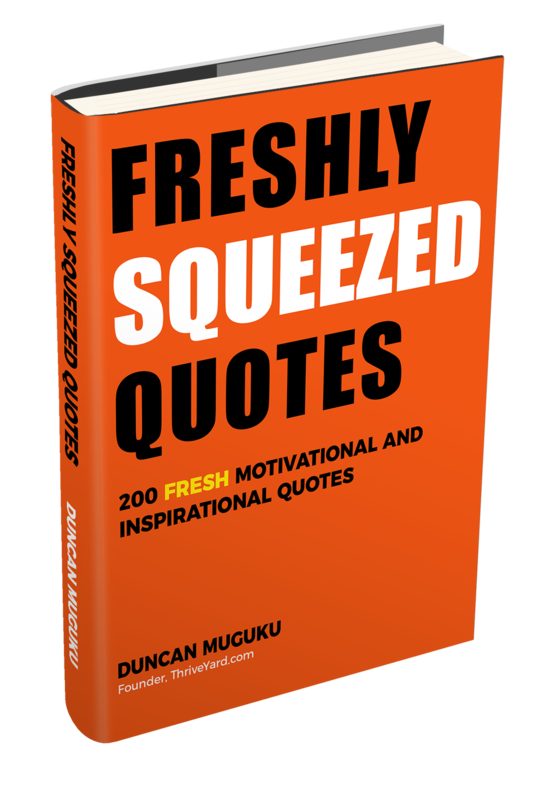 On the other hand, if the feedback that you receive is aimed at simply squashing your dreams, then you can tune it out. In the same measure just like you do not want others to belittle your dreams, do not belittle other people’s dreams as well. Listen to others dreams, respect what they want to achieve, offer constructive feedback where warranted and offer a word of encouragement. Ask others who have achieved their dreams about how they did it. Take the opportunity to learn as much as you can from other people’s mistakes, failures, experiences and success. This single step can shave off so much time from your dream journey because you won’t be reinventing the wheel or repeating mistakes that others have already done. Each little step that you take on a daily basis towards achieving your goal takes you one small step closer to the end point. Small actions taken incrementally add up to progress. Over time the accumulation of these small incremental tasks on top of tasks are what will fuel your momentum leading to a snowball effect where something small gets bigger and bigger over time. Dream killers come in many forms such as giving up too early, fatigue, getting tired, no written plan and lack of planning, vague dream – not specific or well defined, lack of passion for pursuing the dream, lack of patience, underestimating the time and effort it would take. Not asking for help, not helping others, giving in to naysayers, negative attitude, perfectionism, negative self-talk, self-pity, poor self-image, lack of confidence, bitterness, anger and poor execution – anyone can have a dream but good execution is the secret sauce. Other dream killers include: trying to do it all at once, being held back by your past, worrying over things that you can’t control, doubt, pessimism, thinking about failure instead of success, procrastinating, inconsistency and lack of discipline. Making excuses, fear of failure, lack of ambition, blaming circumstances, limited imagination, setting small dreams, not wanting to leave your comfort zone and underestimating your abilities. Additional reasons why dreams are not achieved are desire for instant gratification, being afraid to make mistakes, inflexibility, not having a thick skin, stopping at the small victories, and thinking that you are not deserving i.e. thinking that good things only happen to other people but not to you. Good execution is the secret sauce towards achieving a big dream. Characteristics of Big Dreamers include: a burning desire to achieve; heightened sense of observation and spotting early trends and clues; pushing until you get a breakthrough; experimenting and trying different things, different approaches and strategies; seeing beyond the horizon; following your internal compass, your gut GPS, fire in your belly, or your internal propulsion system; passion; specificity; clarity; stretching yourself; and persistence. Having an active and vivid imagination; willingness to breakthrough your limitations, crush and shatter your ‘limitations ceiling’ into a thousand pieces; belief in yourself; practice out of the box thinking; dissatisfied with the status quo; comfortable with incremental growth and small wins along the way. Bold; visionary; daydreamer; take a chance; dream like a child; see the destination first in your head before you set out; comfortable with being uncomfortable; comfortable with the unknown; and making frequent time for thinking and when you think, think big then think bigger. Other characteristics of Big Dreamers entail: dream then take action; redefine something, improve on something; seek unconventional ways of doing conventional things; make an unknown known; have ambitious dreams; hungry to learn new information; high expectations for yourself; set your own bar high enough; cross the small finish lines and enjoy small wins along the way; confidence in working towards your dream and desire; knowing where you want to go; courageous; innovative; curious; desire to change things; and dream up the future that they want. Big dreamers have a burning desire to achieve their dreams. Big dreamers dream big then take action. On the journey towards achieving your dreams, you will need all the motivation and encouragement that you can muster. Half the battle is won in your mind. It is critical to practice positive self-talk and have thoughts of expectancy. You need to be your number one champion and constantly remind yourself that you are worthy of achieving your dreams; you are good enough; you have what it takes to fulfill your destiny; why think small when you can think big? ; stretch your balloon, keep blowing; it is never too late to start dreaming big. Be optimistic. Pessimism is a dream killer. Dream predators will often be lurking around to kill your dreams. Cynics will tell you multiple reasons why your big dream won’t work rather than why it will work. Negativity is the path of least resistance; human nature is wired almost on autopilot to zoom in with laser like focus on the negative aspects about why something won’t work. We do this very well with the precision of an eagle swooping in for a kill from 10,000 feet in the air down to an ocean where a poor fish is swimming innocently enjoying a warm sunny day and the gentle breeze of the waves. Develop the ability to block out naysayers and on the other hand be happy for others who achieve their dreams and celebrate them. Identify what lights up your fire and revs up your engine. Expect more, think big, and then think bigger. Supersize your dream. Dreams are won or lost in your mind. Have a positive mind frame. Keep rising up each time you fall down. Everyone has the capacity and potential to do something great. Be your number one champion and believe you deserve to achieve your big dreams. A discussion about big dreams would not be complete without talking about failure. Anytime you set yourself up with a big dream, your dream “coin” so to speak can land on either one of two sides – heads = success and tails = failure. A major reason why many people do not pursue their dreams is because of the fear of failure. Imagine for a second if there was nothing like fear or failure in the world, what would you do in this kind of a world? Failure is always a possibility. There is no true success without failures and setbacks. Failure is hurtful and disappointing. Fear of failure causes premature death of dreams more than anything else. It would be naive to ignore that failure is a possibility but at the same time it should not hold you back from taking action. Have fear but do it anyway. When you are doing your action plan, think through possible downsides that you could encounter in achieving your dream and identify failure mitigating steps. In addition, doing a post mortem to analyze what caused the failure and learning from the past mistakes can help to inform future endeavors. One more thing to consider – How deep is your ‘well’? What power and abilities do you possess deep within yourself? We often underestimate our potential and coast through life on auto pilot. That is why sometimes adversity, struggles and failure can be good because when you reach the edge of a cliff and there is no more road visible and no safety net is in sight, that is when your mind goes into overdrive and figures out incredible and extraordinary options and solutions that you had not thought of before. Part of achieving your big dreams involves working through others. It is very rare that a single person is able to achieve a big dream on their own. Big dreams take many hands to accomplish; it requires team effort and synergy, where the whole is greater than the sum of its parts, the 2+2=5 effect. You need to be able to inspire others, make others believe in your dream and get buy-in for your ideas, your cause, belief, purpose, objective, results or goals. Clearly articulate your expectations and the level of involvement that you expect or require. Let people know what specific actions they can help you with towards the attainment of your goals and eventually your dreams. You would also need to show the connection/connect the dots between other people’s input and the achievement of your dream to enable others to see the big picture and enthusiastically support you. Some key skills to perfect when working with others are trust, delegation and communication. There is likewise tremendous power in asking for help and in similarly talking to others and brainstorming to get different angles, perspectives and points of view. It further strengthens and refines your trail of thought, thinking, vision and overall dream. Inspire yourself by learning about how other successful people have achieved their dreams. To keep your fire burning and your dream alive, read inspirational material such as books, blogs, articles, magazines; listen to motivational audio CD’s, podcasts; watch motivating videos and talks; attend workshops, webinars and courses and listen to inspirational, uplifting and motivating music. Share your big dream with a few people who you trust. This becomes a commitment between yourself and them and it helps you to work extra hard in order to keep your word. It correspondingly increases accountability because the people who you have told about your dream will be checking-in on your progress and keeping you on your toes when you are slacking off. At the same time they can also offer an encouraging word when you are going through storms. One vital skill to master in the course of working through your big dream is big picture thinking. The ability to see both the whole and the parts at all times and how they are interrelated and interconnected is critical. Each time you are working on a small task instinctively know how it aligns to the big dream and each time you look at a goal you can immediately see in your mind how to breakdown the goal into small components that are easily digestible. In other words you should be able to see in your mind the relationship between a single brick, the blueprints and the finished building and vice versa. 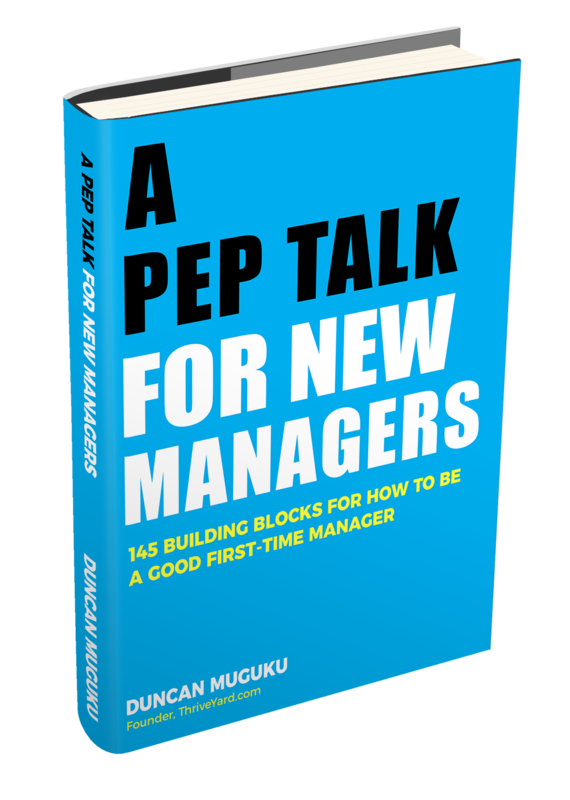 Moreover, get into the habit of volunteering to solve big challenges and making improvements at your place of work, school, at home, in your community etc. This will help you to strengthen your decision making skills and get familiar with the critical paths that it takes to solve big challenges and hard-wire these critical paths into your memory circuits. Every time that you solve a bigger problem your mental capacity increases. Develop an inquisitive mind. Ask good and thoughtful questions. Know your blind spots and how to mitigate them. Work on forward thinking – think like a chess grand master, who is always thinking several moves ahead of the opponent. Which words do you choose when you speak about your big dream? What comes out of your mouth reflects what is within you. Think possibilities and speak possibilities. Believe in your dream and say so when you speak. Have conviction. Don’t self-sabotage yourself with your words. Words have power; they can be used to build up or tear down. Do not be double minded i.e. believing that your dream will come true, and at the same time believing your dream will not work. This causes conflict and confusion to both yourself and others. According to Investopedia “an ‘Inflection Point’ is an event that results in a significant change in the progress of a company, industry, sector, economy or geopolitical situation. When extrapolated to someone’s personal life or career, a Strategic Inflection Point could be that point in your life where as a result of deep internal reflection, you encounter significant forks in the road and whatever decision you make has major consequences. It could mean having to change the tactics and strategies that you have been using to take a 180 degree turn and adopt new tactics. It is typically over a decision that you would agonize over for a long time before settling on one option instead of the other. A big dream can be a catalyst for a personal Strategic Inflection Point. 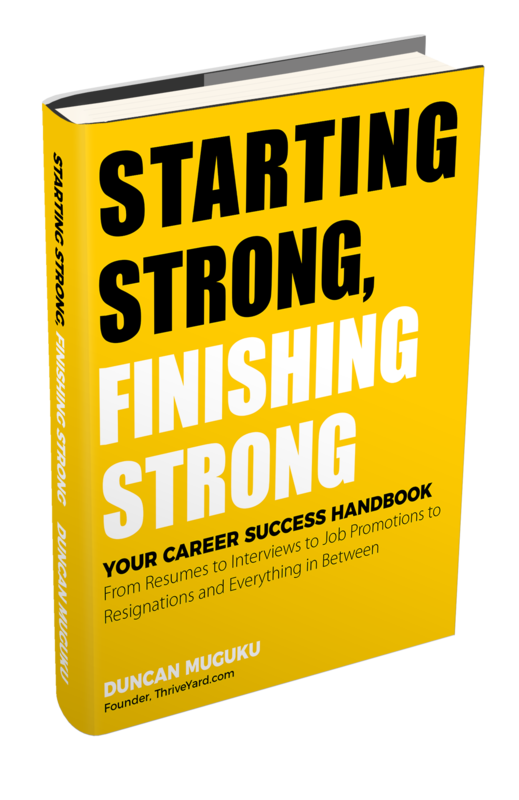 For example, deciding to leave a well-paying and secure job to pursue a dream of owning your business, or deciding to leave work to go back to school to pursue a master’s degree or switching careers e.g. you are in one career field and you are thinking of changing careers to a totally different field such as a Doctor who now wants to become a Chef. Not all plans go as intended. Allow room for trial and error. Be flexible enough to retrace your steps if a chosen route does not work. Go back to base and figure out another route. Don’t start too big in your execution. Dream big and start small. A big dream without proper execution can be doomed for failure. Avoid get rich quick schemes. A quest for fast and quick results can be tragic. Overnight success is not guaranteed for many. You learn and improve through the implementation process and from learning from mistakes and failures. You will get to see what is working and what isn’t. Take stock of lessons learned and learn from the lessons. Don’t let fear of the unknown hold you back. When you don’t succeed at your first try, keep trying again and again. Practice makes better. Just like in any sport, a sportsperson has to keep training and training to become good at their craft. Build or join a community of big dreamers. Share your dreams and energize each other. Be each other’s jogging partners, accountability partners and cheerleaders. Start or join an ‘Ambitious People’s Club’ or a ‘Big Dreamers Club.’ The group can be online, offline or a combination of both. Share stories of inspiration and uplift each other mentally, emotionally, and spiritually. Enrich and nourish each other with stories about your big dreams and regular progress status updates regarding the pursuit of your dreams. Stretch each other. Report back to the team on what baby steps and milestones you have achieved. The goal here is to keep your dream alive by any means necessary. A good support system of like-minded people goes a long way in preserving the dream. As a group read a book together about someone who has followed their dreams, also discuss about a blog article like this one, and share your unique insights that you have learned from the book or article. What two things can you use from the book or article to fuel you towards achieving your dream? Watch inspirational movies, read biographies, listen to motivational talks, uplift one another and reach out to help others outside your big dreamers club. Motivate each other. Coach each other. Invite role models to give talks and celebrate each other’s milestones. As you are pursuing your big dream, remember to take good care of yourself. Get enough sleep, smile, exercise, drink plenty of water, get good nutrition, have an attitude of gratitude, be open minded, practice common courtesy, forgive others, build and cherish relationships, be kind and generous to others, let go of worry, be humble and make time for fun and games. It is very discouraging to hear a successful person talking down, ridiculing or belittling another person’s dreams. By the very definition, a successful person is one who pursued his/her goals and dreams and did well, so why should they turn around and discourage other people’s dreams or even make fun of others dreams? A successful person has a moral obligation to guide and mentor other rookie dreamers to achieve their dreams. As a successful person you should teach others about your failures and mistakes. Don’t just poke holes on other people’s dreams. Do not become a “professional balloon buster” someone who is skillful at blowing the air out of other people’s dreams. When warranted and requested, please provide constructive feedback in a respectful way. When you have big dreams you will almost certainly encounter people who want to “protect you from yourself”. They will criticize you and your big idea and tell you how unrealistic you are. You will hear phrases like: “You are wasting time,” “Get back to earth,” and “Your idea won’t work”. However, take a moment to critically dissect what they are saying, are they talking about you or are they simply projecting their own fears on you? Are they projecting their lack of beliefs in big dreams? Are your big dreams making them realize that they are not also dreaming big? How about if you turn their criticisms into rocket fuel to propel you upward and prove the critics that they were wrong? Remember that many people appreciate a dream and an idea after it is successful and not during its infancy stage. When you are busy tinkering with your invention, few people will see the value of what you are doing until you present them with the finished product. Don’t get distracted by critics, keep your vision strongly alive in your mind and keep pressing forward towards the finish line. Be patient, be like salt, be like light – make a difference – just like salt adds saltiness to whatever it is added on, and just as light shines in the darkness, take the clay that is thrown at you and make a beautiful pot with it. Detractors will criticize you and your big idea and tell you how unrealistic you are. When you decide to aim high, pursue your big dream and make it happen, you are essentially taking a risk. You do not know if your dream will work out or not. The Merriam-Webster Dictionary defines risk as: the possibility that something bad or unpleasant (such as an injury or a loss) will happen; or someone or something that may cause something bad or unpleasant to happen. We have been conditioned over time to work towards reducing risk as much as possible, yet we also know at the back of our minds that the more we reduce the risk the lesser the potential for outsized returns on investment or simply put the higher the risk, the higher the reward; the lower the risk, the lower the reward. When we think of risk we think of danger and uncertainty, but how can we overcome the danger, uncertainty and have peace of mind to pursue our big dreams? The simple answer is that there is no guarantee of peace of mind, there will always be an element of risk associated with pursuing your dreams. The solution is to develop our risk tolerance level, plan as best as we can and keep at the top of your mind the overriding reason why we want to achieve our dream. Moreover, as you break down goals into very small easy to-do tasks, you can gradually build up your risk appetite because as you finish one small task you realize it wasn’t too difficult, and then you move to the next small task and then the next one. In addition, build your tolerance to being told “no.” Each no brings you closer to your yes. Hearing “no” means that you are making progress; it means you are trying one more time. Stretch yourself, do not coast, do not settle for less, light the fire within you, do something. Think expansively without fear and limits. Think like a child whose mind has not been polluted by the word “can’t” and “it can’t be done” think of possibilities and passionately go for your dream. When someone tells you no, go back and ask again and again – give your best efforts to convert as many no’s as possible into yes’. Adversity brings opportunities if you hang in there long enough. Sometimes a closed door is an opportunity for you to find another way to go through. Risk is at the epicenter of actions taken towards achieving dreams. We can draw a lot of strength from Thomas Edison’s story every time we have an obstacle on the path of working towards our dream. Perhaps we have better advantages nowadays in the modern technological era so we should be capable of achieving our dreams faster based on all the multitude of resources that are available. Other people’s big dreams are just as important as our own dreams. We should always strive to help others to realize their dreams. The first step is to ask other people what their dreams are. Listen attentively and be sensitive because it is not easy to tell other people about our dreams. We hold our dreams near and dear to our hearts and the last thing that you want is to hear someone else discouraging you from your dreams or making fun of your dreams. Be respectful of other people’s dreams and offer to help them in any way that you can. It could be in the form of an encouraging word, being an accountability partner, being a mentor, being a coach, offering financial help where possible, making referrals and teaching others what you know. In addition, we have the ability to see the potential, value and greatness within other people however they could be afraid or not aware of their potential or they are simply making one excuse or another for not utilizing their gifts. You can encourage them to step up and exploit the greatness that you see in them. Sometimes we just need someone to believe in us for us to stand up and pursue our dreams. It happens all the time for example people often see the potential of someone to be a good political leader and they encourage them to run for office and they do and become very effective at serving their electorate. Or encouraging someone with a good singing voice to try out a singing competition somewhere and they participate and go on to become superstars. It is very exciting, encouraging and heart-warming to see others succeeding in their calling and talents. Let us keep this cycle going on of helping one another to follow and achieve their dreams. Eventually after a long period of hard work, persistence, determination, perseverance and overcoming obstacles, you will reach your final destination. Take some time to reward yourself for the good job that you have done. It’s celebration time! Do a postmortem, analysis or evaluation of the journey that you took towards achieving your dream. Write down a brief story that summarizes the ups and downs that you faced, the emotions that you experienced, the lessons that you learned, how you overcame obstacles and what kept you going. Also note down all the external help that you received from others and please remember to thank everyone who helped you in one way or another to achieve your dream. Share your brief story with at least two or more people to encourage and inspire others to have the courage to pursue their big dreams. Please be generous with sharing your first-hand knowledge. If you so wish you can plan for yourself another harder and more difficult big dream and repeat the whole process of achieving your dream again and again. This is a letter from one big dreamer to another. You might think that you are just ordinary but you could be extraordinary. How will you know how extraordinary you can become if you don’t try to pursue your big dream? Step up and jump over the wall of fear. Chase your dream with passion. Find out what you want to achieve in life and know exactly why you want to achieve it and when, and then embark on the exciting journey of figuring out the “how.” Every new day you should become better than you were yesterday. Do one small task every day that will get you closer to your dream. By doing this the laws of incrementalism, momentum and compounding will all be on your side. Do not loose your dream. Keep your dream alive. Write down your big dream in one or two specific sentences then read it out aloud and record yourself. On a regular basis, listen to the recording of your own voice talking about your big dream. Let it sink in firmly in your mind. May your life be a story of hope, success and inspiration to both yourself and others. In conclusion, dare to Dream Big and take steps towards achieving your Big Dream. Don’t be afraid to start small or to take baby steps. I wish you the very best wishes as you follow your Big Dream. This is your ultimate guide on chasing your dreams. This article is an in-depth exploration on how to dream big. Tips include the journey to a dream, life cycle of a big dream, crushing self-limiting beliefs, big picture thinking, characteristics of big dreamers, overcoming fear of failure, setting goals and action plans.